April 3 2018. Last year in February I went on two trips south for 15K races to break up the winter training; this year I was in Physical Therapy where I was getting some dry needling and other treatment for a high hamstring injury that was cutting into my efficiency late in 2017. My PT guy, Brad, cut me loose in early March and said, “Go run hard and if anything acts up again, come on back and we’ll get you sorted.” So here I am after only 3 and a half weeks training, heading for Louisville and a 10 Mile Run on the7th of April. I was able to run reasonably effectively in the USATF Masters 8K Championship in Virginia Beach on St. Patrick’s Day, the 17th of March. I ran 36:35 (net), a little over a minute slower than last year when I took 2nd in the Age Division, but not too bad everything considered. The competition was a little stiffer this year. That time would have gotten me 6th last year; this year it got me 8th. But this year I had the satisfaction of being part of a team, the Ann Arbor 70 and up, with Doug Goodhue and David Cohen. We were able to wind up on the podium in the 70 and up division. So will I be ready for a 10 Miler? I have been able to do some decent interval workouts—8x400 meters in 93-97 seconds, for example, and I have done two long runs of 10+ miles. What I have not done is (race) pace work over 5-6 miles. So we will have to see how I last. I should at least break 1:20 but getting down to 1:15 or under may be too much of a challenge with the short prep time. So why Papa John’s? 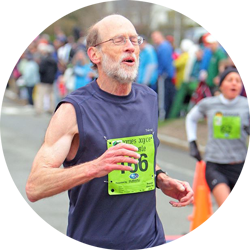 Partly it is timing; it should help to set me up for a good 10K national Masters championship race in late April and the Half Marathon Championship in early June. But it is also a major regional race. Around since 2001, it is in its 18th year. Plus Papa John’s was our ‘go to’ carry out meal when my kids wanted pizza in the 2000’s! And did I mention that Indy icon (and Denver, I know, and probably Tennessee too) Peyton Manning, has been associated with them? And it is only a two hour drive from Indy. Might I earn an Award too? They give Age Division awards in the form of Papa John’s Gift Certs…up to $50 for first, but dropping off to $25 and then $15. First place would be nice—maybe I could treat family and friends? What has been the recent experience? 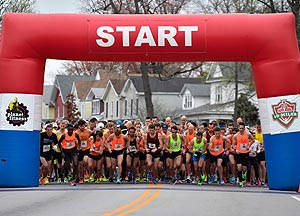 The race is enough of a regional attraction that it takes a sub-50 minute effort to win the Overall Men’s 1st prize, but, unlike the Crim 10 miler in Michigan later in the summer, it does not typically take a sub-48 to win it. That goes for the Age Division contests as well, although, as always, it does depend on who happens to show up. 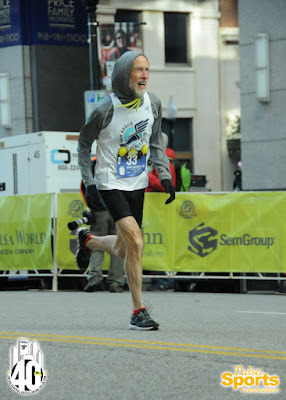 I was able to run 1:11:35 at the Double Bridge 15K in Pensacola last February. If I could run that well again it would be age grade equivalent to a 1:17 to 1:18 depending on whether you build in the average year to year deterioration of about a minute suggested by age-grading tables. I like to think that defines the frontier but if you are operating within the frontier, when rehabbing injuries for example, one can approach or even better the previous year’s time. 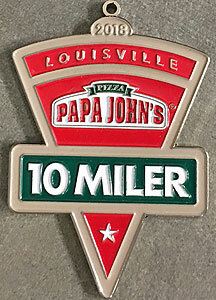 That looks like it might stand up fairly well in the Papa John’s race. In 2017 the winning 70-74 time was 1:22+; the year before was 1:26+. So I am starting to smell the pizza! Of course that’s risky thinking—you never know when someone unexpectedly targets a given race! But what about the course? If it is a killer course, maybe that will slow me down some? They post a map and describe the course as: “The Papa John's 10 Miler is known for its fast, rolling course and the winding hill in Iroquois Park.” That all sounds good although I wonder a bit about that ‘winding hill.’ No elevation chart is supplied. For now I will take that as a positive overall, but I will try to drive that hill in the park the day before. The other thing that could get in the way is the weather. The long-range forecast has varied from day to day. Over the weekend, the advance forecast for Saturday, April 7th at the start time of 8 am was for 43 degrees and rainy—not my favorite and that might affect the time, especially if the roads are at all slippery. But it should affect everyone, so chances for 1st are not diminished. And there is always the chance that the weather moves through more slowly and we get the Friday forecast instead, of partly cloudy and 40 degrees. Looking for a good race! Ha! By Monday the start time weather forecast had changed to 31 degrees and cloudy with no precipitation and wind under 10 mph, the best forecast yet. Unfortunately by today the temperature forecast was still down just below freezing but now they are saying snow showers again, like they did last week, and double digit winds—no fun! As always we will run with whatever we get, as long as it is not dangerous weather. It is not looking like a great day for fast times, especially if the footing is at all questionable. To match the age grade I achieved at Virginia Beach with a 36:35 8K would take a 1:15:51 ten miler, just over 7:30 per mile pace. As noted above, the equivalent of my Double Bridge Run 15K 1:11:35 last year would be 1:17 to 1:18, depending on whether one adds the minute for being a year older. The equivalent of running a 1:10:36 15K as I did at Tulsa just after my 72nd birthday would be about 1:16. It looks like going out at a 7:45 per mile pace for the first 5 miles should be reasonable and then see if I can pick it up over the last 5 miles. But will I be reasonable? We will find out! 4/5/2018 9 pm update--Looks like we might luck out with the weather--latest forecast is for 32 degrees and 10 mph, but cloudy to partly cloudy during the race--That's better than snow or rain which has been plentiful recently and is in the forecast for the week after the race. Bundle up and try to tuck in with a small pack, when feasible, or at least share the load, on the last 4 miles heading into the wind and the finish line. Best of luck, Paul. Go gettem! Good luck Paul! Loved your personal analysis. Even we “slower” runners go through something similar before our races, too :).